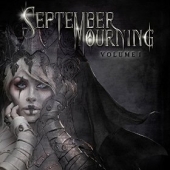 September Mourning are alternative hard rock; this is considered a transmedia project which means it's a story told on multiple platforms -- this project is music coupled with a comic book. This EP is second to their first album, "Melancholy," that was released in 2012. If you're a fan or watcher of TNA Wrestling then you might have heard the song "Before The Fall," that single has been included on the EP "Volume 1." I like it when a new flavor of music comes out and, when it's presented in more than one level, it doesn't just garner new fans, it creates seekers of a genre that may have not been discovered before. Metal and the deeper bowels of its kind have the luxury of expanding their reach, unlike pop, which I feel is one-dimensional. September, as she is named, is the voice of the band. She sings, screams and pushes her voice into your heart to tell a story. Want to know what that story is about? Buy the comic book to find out. Fans of the band are called, "Children Of Fate" (which is also the fourth cut on the "Volume 1" EP) and they are encouraged to paint, write about and produce art for the band who in turn posts it on their Instagram account. Facebook is a great tool for fans and the band to connect as well. It's crowd-funding on a whole new level. The music blends great with the theatrical aspect of September Mourning. It's not gimmicky or campy, but it's pretty frickin cool. September Mourning cover the timeless classic "Stand By Me" and they really amp it up and give it a new twist. Members: September † Riven † Wraith † Rasper † Shadou † Stitch † or for those who want to know their real names - September - lead vocalist, keyboards; Rich Juzwick - guitars; Josh Fresia - drums; Clayton Ryan - bass guitar; Chris Egert - song writing - guitars, programming. Check out the website behind the story: http://www.septembermourning.com and click here to follow them on Facebook https://www.facebook.com/septembermourning/.